Imagination is the eleventh studio album recorded by American R&B group Gladys Knight & the Pips, released in October 1973 on the Buddah label. The album, the group's first for Buddah after leaving Motown, includes their first and only Billboard Hot 100 number-one hit "Midnight Train to Georgia", which also reached number-one on the R&B singles chart. The album also produced other the successful singles, including "I've Got to Use My Imagination" and "Best Thing That Ever Happened to Me", with both songs peaking at number-one on the R&B singles chart and top five on the Billboard Hot 100, and the moderately successful single "Where Peaceful Waters Flow". The album was also their second studio album to make the top ten on the Billboard 200 and their second of five R&B albums chart-toppers. All tracks written by Jim Weatherly, except where noted. ↑ Wynn, Ron. Imagination review at AllMusic. Retrieved 2011-10-16. ↑ Christgau, Robert. "Imagination review". Robert Christgau. Retrieved 2011-10-16. ↑ Gersten, Russell. "Imagination review". Rolling Stone. Archived from the original on March 9, 2009. Retrieved 2011-10-16. 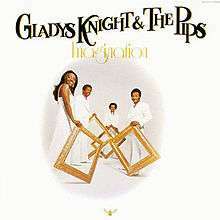 1 2 "US Charts > Gladys Knight & the Pips". Allmusic. Retrieved 2012-11-18. ↑ "UK Charts > Gladys Knight & the Pips". The Official Charts Company. Retrieved 2011-10-16.